Spring has Sprung and we are relocating to Quantico! To celebrate, I am hosting a HUGE giveaway! With prizes ranging from gift certificates to products from a good variety of companies to a free session, there is something for everyone! All companies are based in Quantico and surrounding areas. I’ve got smelly stuff, yummy stuff, clothes, jewelry, and more! There are over 20 prizes from over 20 great companies! Winners will be chosen at random and announced on each page on May 1, 2014 (so make sure to like them all!). You have until May 3rd at 7:00pm (approximately 48 hours) to make contact/accept your prize or another name will be chosen. This giveaway is in no way affiliated with nor endorsed by Facebook. 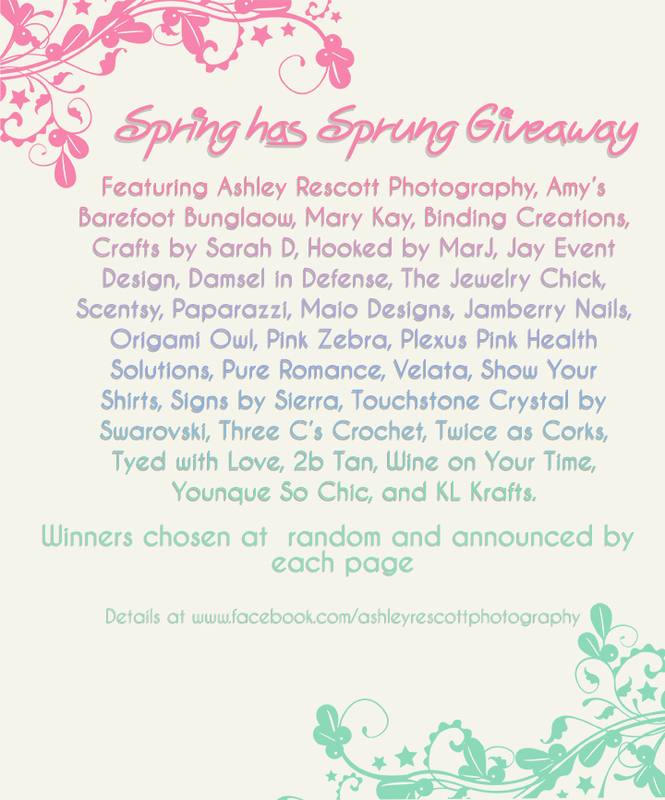 Ashley Rescott Photography is hosting the giveaway and is not held responsible for prizes; each business is responsible for their own prize and contacting/announcing winners! I’m so glad I found your page! Everything is so beautiful and if we ever get stationed at Quantico I know who to call!!! Super excited for you to be joining us in the Fredericksburg area! Ive got lots of exciting events in May, including my birthday! Hoping for the win on the giveaway! Wouldnt that be a great birthday present for myself, lol!